I am Groot. I am Groot, I am Groot. I am Groot. I am Groot, I am Groot. I am Groot. I am Groot, I am Groot. I am Groot. I am Groot, I am Groot. I am Groot. I am Groot, I am Groot. I am Groot. I am Groot, I am Groot. I am Groot. I am Groot, I am Groot. I am Groot. I am Groot, I am Groot. I am Groot. I am Groot, I am Groot. I am Groot. I am Groot, I am Groot. HA! Just kidding. It’s been a good while since I have written a figure review, but I picked up this set and could not be more happy. So you get a review! Hooray! Groot, of course, is one of Marvel’s Guardians of the Galaxy. There is a new movie coming out in May, and if you haven’t seen the first one… STOP READING THIS AND GO WATCH IT. Seriously, if you are the slightest fan of Marvel, Sci-Fi, Star Wars, or fun movies – chances are you will adore this franchise. Groot is an alien humanoid tree, and the only thing he can say is the phrase “I am Groot.” In the movies, he is voiced by the acid-throated Vin Diesel. He is the sidekick of the brilliant and demented Rocket Raccoon (voiced by Bradley Cooper). Trust me, it works. 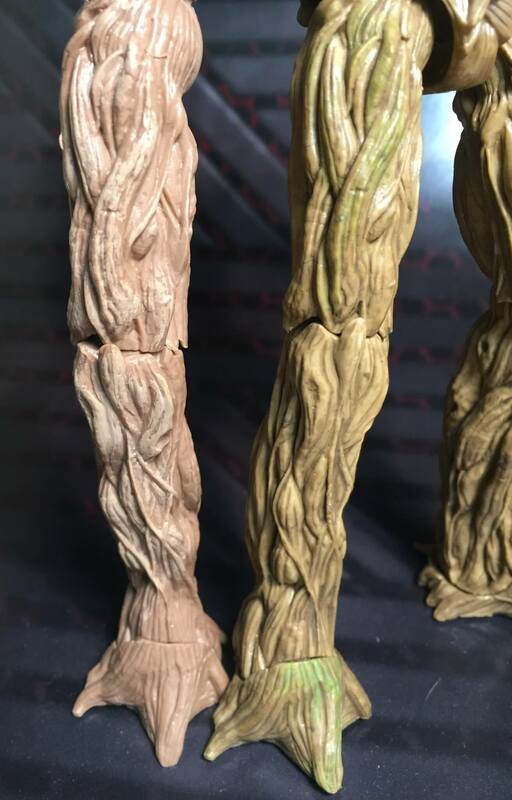 Before this point, Groot was only available from the Marvel Legends line if you bought the whole first wave of the Guardians ML figures. Even being a toy nerd, I was not able to do so. At $20 bucks a pop, it gets hard to justify buying one of these things just because you want a leg or whatever. With the release of the second wave of Guardians ML figures from GotG Vol. 2, Toys R Us has exclusive rights to a single-packaged Groot figure. Actually… you get 3 Groot figures, sort of. They call it the “Groot Evolution” set. You see, Groot is a plant. Like a plant, he can grow back from cuttings of himself. In this set, you get big Groot, tiny Groot in a pot and baby Groot, doing his wave from the latest Guardians trailer. Baby Groot does not stand very well, so I had to lean him up against potted Groot for these pictures. The plastic is way too rubbery to hold a shape stable enough for the tiny feet. At 10 minutes from Hell, we are “good enough”. 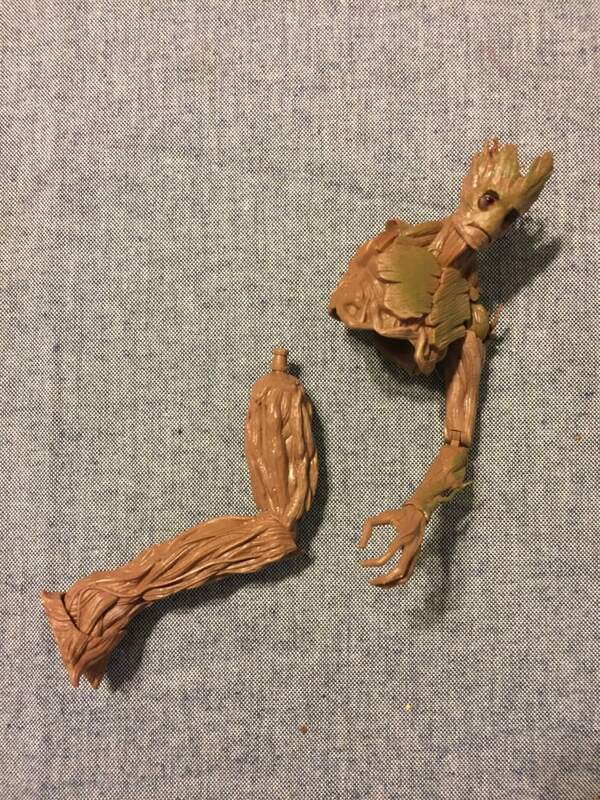 The plastic on this new TRU Groot is more soft and flexible. Not too much, but a nice amount. In contrast, the BAF Groot felt very brittle and stiff. The paint is also not as nice on the BAF parts. The TRU version has a nice dark wash and some green highlights, while the BAF just had some dry-brushing going on. 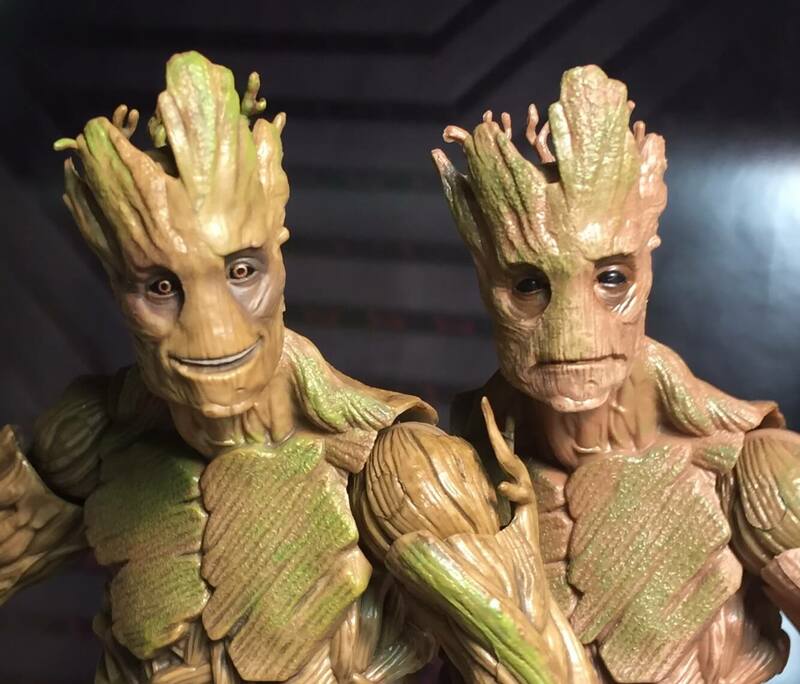 Other than that, the two Groot (Groots? Grooti?) are virtually identical, except the head. TRU has a smiling expression, and the BAF has a more somber and serious mug. The figure itself is very tall, and has a great, detailed sculpt. looking over at the figure on the shelf, there is no mistaking that he is supposed to look like he is made of wood. The pose-ability is about what you would expect from a Marvel Legends figure, with a ball-jointed head and torso, as well as disc and pin shoulders, wrists, hips, knees and ankles. Double joints in the elbows, round out the articulation. You can get Groot in a surprising number of poses. Overall, this is a great toy. 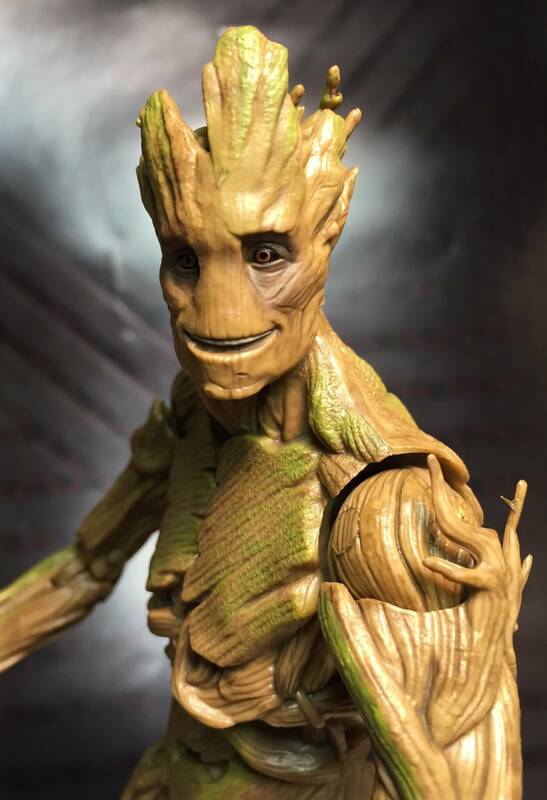 For collectors – it looks amazing in a display, and any kid would love to have his or her own Groot to play with. It’s sturdy enough to withstand play and is pose-able and solid enough to last. Chances are that you probably wanted one of these already as a Marvel Legends fan. But here is one more endorsement that you should pick one up when you come across it. At $20, you are getting the BAF by itself, with a couple of great accessories.